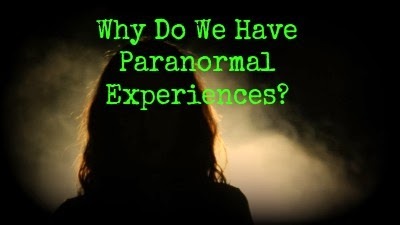 Why Do We Have Paranormal Experiences? My impression as a reasonably well-educated, well-read and thoughtful person is that one of the main forces by which human beings have been driven throughout our relatively short tenure on planet Earth is – sheer curiosity. Trying to enlarge our perspective to encompass that which we do not understand, or know how to use – eg fire, so that it can become an aid to our survival and/or an addition to the joys of living – has led us to the complex, sophisticated and comfortable way of life to which those of us living in the West have grown accustomed. We are now going to have to channel our curiosity in the direction of surviving the consequences for our planet of that very lifestyle, which has begun to consume us all…. From this perspective, it may be that the purpose of paranormal experiences – since the eighteenth century dawn of the Age of Reason – is to challenge our curiosity to take us beyond the world of the evidence of the five senses, which conventional science tells us is the only world that exists, into an understanding and appreciation that reality, whatever it may be, is vaster, richer and more complex than our Earth-bound brains are probably ever capable of comprehending. Some paranormal experiences can be deliberately induced by going into meditative or trance-like states. For example, whether one believes or not that mediums relay information from the ‘Other Side’ via the communicative spirits of those who have died, there is no doubt that the phenomenon of mediumship exists, through which information can be transmitted paranormally. This has been comprehensively researched and thoroughly documented for well over a century. However, even the best mediums have occasions when, try as they might, the ‘Other Side’ is simply not co-operating. Even although humans can induce states favourable to the paranormal manifesting itself, there is no guarantee that it will. Other paranormal experiences simply descend without warning. This has been the case, for example, with every single one I have ever had. Far from trying to induce such occurrences, had I known how to block them I certainly would have done so! Life in its ‘ordinary’ register is quite complicated enough, in my view, without seeking to make it more so…. There is undoubtedly a ‘tricksterish’, tantalising, highly unpredictable element to paranormal manifestations across the board. This is one of the many reasons why the measured, sensible, thorough and logical procedures of reductionist science simply cannot fully come to grips with the paranormal. Provoking our curiosity by tormenting our species, unpredictably but persistently, with experiences clearly outwith our current common consensus of what reality is, strikes me as a pretty good way of enabling the evolution of human consciousness at this stage in our development. Whether one considers that this provocation is driven by blind chance, or by some form of divine teleology, is a matter of opinion or belief. How could one ever prove it, one way or the other? From a personal point of view, the drive to understand why we are here and what our lives are for, allied to a profound curiosity about just about everything, has certainly powered my journey through life. I am basically a rational pragmatist in my approach. But I got to my fifties, a time when anyone with any reflective capacity begins to look back at their life experiences and patterns, in an attempt to make some sense of it all. I had to face the fact that a series of experiences had accumulated over the course of thirty years which I had largely kept to myself. Why? Because they did not fit the parameters of what our culture defines as normal. But memories of these experiences did not go away because I had tried to ignore their existence. They simply lurked, permanently provoked by my refusal to attend to them. Furthermore, a career I had never aspired to in my wildest dreams, ie that of being a professional astrologer, had been correctly predicted for me in my twenties – following a chance encounter with a complete stranger – when I was not at all receptive to, or welcoming of, that type of information. Through my studies of astrology I discovered a universe replete with correspondences, and saturated with meaning. I embarked on those studies for one major reason: the notion that you could read the significant patterns of a person’s life from marks on a piece of paper set my innate curiosity, and my rational pragmatism, a challenge I simply could not resist. By deciding properly to investigate a subject which I couldn’t believe could have any value, but which in practical terms had demonstrated great accuracy about me and my life, I opened up a great adventure for myself and for many students and clients who joined me on the road. Dismissing the whole thing, with the kind of closed minded fundamentalist prejudice which gives true science a bad name, would have closed the adventure down before it ever began. The conclusion I came to, long before my 2001 health collapse stopped my career in its tracks, was that astrology is another form of physics, revealing as quantum physics does the dance of universal energies of which we are all part. But astrology causes grave offence to conventional minds, by moving from mapping the movement of patterns of energy through space/time within our solar system – via mathematical calculations no astronomer could fault – to ascribing meaning to those patterns…. Another reason for psi/paranormal experiences may be that, especially in some cases, they compellingly demonstrate the relationship between the micro world of individual humans and the macro energy field of which we are all part. The intuitive experience of mystics through the ages and the experimental data of contemporary scientists converges in the understanding that all things are connected, each tiny particle part of and interacting with the One, – or the Quantum Vacuum / Zero Point Field if you prefer the terms of quantum physics. On surveying all my paranormal experiences, there are three which stand out as the most powerful. These are the first, in July 1970 when I was visiting my paternal grandparents’ grave for the first time. From this arose an experience of universal grief at the pain of the human condition, channelling through the personal. Then there was the mystical experience I had in autumn 1971, newly in love and responding to the timeless sound of the pipes in a beautiful natural setting at dusk, making me feel a blissful, fearless part of all Creation. And most recently, in September 1999 the seeming attempt by my mother-in-law’s spirit to communicate something of great urgency for her to my husband, startled me even more by giving rise to the collective ‘babble’ of apparent spirit voices attempting to use me as their channel. At the time one is too caught up in the power, drama and sheer unexpectedness of such events to have any perspective at all. It is only on reflection – and I have reflected on those episodes intermittently for a very long time – that the full impact of their very strange, alien and disturbing nature registers, and the ‘why me?’ question arises. The only answer I can come up with after thirty years is ‘why not me?’. I am left with the somewhat unsettling sensation that my small person, for reasons entirely beyond my ken, functioned briefly in those episodes as some kind of collective instrument. Despite the unnerving nature of two out of the three, and their disturbing effect, they also left me over time, especially through the mystical experience which was a great comfort and inspiration, feeling clearly that I was a tiny but unique part of something vast. This feeling, despite all my struggles with a naturally sceptical bent, has never left me. I have thus been able to draw on it for comfort in some very bleak and painful times in my life. It has also helped me to come to terms with one of the central paradoxes of all our lives : “I am special, and I am not.” At every level in nature, the minute can provide us with glimpses of the vast – in which everything, no matter how small, has its unique part to play. 22 These three are the only ones so far which I have submitted for publication: all have been published in the UK and the USA.